Accounts of the inception of the punk rock band Wizo differ, even among the band members themselves. While Jochen traces the band's roots back to 1981, Axel claims that the band started in 1985, when the band made their first demo recordings. In 1986, the band from Sindelfingen, Germany changed their name from "Wieso" ("Why?") to "Wizo". What did not change was their steadfast commitment to their punk origins. True to their punk style, they more or less shunned the establishment and largely did what they wanted. 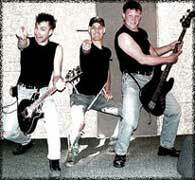 To remain independent from commercial influence, they formed and published under their own record label "Hulk Räckorz." In 1991, the band's debut album Für'n Arsch appeared. As a publicity stunt, the group appeared in front of the courthouse in Calw in support of actor Manfred Krug, who was on trial for having harassed and insulted a slow driver whom he had wanted to pass. The band issued a statement in support of Manfred Klug's freedom and any measures that could rid the streets of slow drivers who obstruct the roads. The stunt landed them coverage in Germany's most widely circulated tabloid, the Bildzeitung. It was in 1993, however, that Wizo first gained widespread attention from the music world in 1993 with their cover of Ace of Base's "All That She Wants". The song received radio play Europe-wide. Their self-produced video of the song was even played on MTV. Their 1994 album "UUAARRGH!" sold over 100,000 copies in Germany. It also won them contract with the California cult label Fatwreck Chords which promoted the band's work in the U.S. The band has toured in Germany, Switzerland, and Austria as well as in Japan. In 1995, Wizo toured with Die Ärzte. Over time, they survived attempts at censorship and left various scandals in their wake. After their last tour in 2005, the band dissolved so its members could pursue other projects. Wizo [German and English] - This is the official webpage; however, it contains very little information about the band.